Erik Tillman from DePaul University responded to my recent piece on Politico.com. It is well worth a read. Recent events have spawned a number of articles analyzing Turkey’s current political situation. Having been awakened by events of the past two years to the observation that Turkey is not quite a model Muslim democracy, Western analysts are now instead debating whether Turkey can any longer be considered a democracy at all, and what these developments suggest about Turkey’s future. At one end of the spectrum are analyses that treat these recent developments as a case of democratic regression. A recent review essay by Larry Diamond suggests that Turkey reached a tipping point in 2014, while a column by Thomas Friedman notes that “it is really hard” to call Turkey democratic anymore. The language of “democratic regression” suggests that Turkey is at least a borderline democracy. One can also find genuinely naïve analyses suggesting that the government of President Recep Tayyip Erdogan has only a few “overreactions” marring its otherwise “astounding” record. At the other end of the analytical spectrum, Steven Cook has recently published a provocative article claiming that Turkey’s situation is worse than most outside observers think. Describing Erdogan as “the sun around which all Turkish politics revolve,” Cook argues that Turkey has come to resemble the patrimonial dictatorships of many Middle Eastern states “in which neither individuals nor state organizations like the military or judiciary can check the ruler’s powers, and support for the system is generally narrow, often based on family, ethnic group or region.” This article is important, not least because it challenges Western complacency about the degree to which Turkish democracy has been undermined and the dangers that this poses to Western interests in the volatile Middle East. And its clear-eyed argument challenges observers of Turkish politics to think clearly about what (if any) prospects for democracy remain in the near-term. I offer a different interpretation that falls somewhere between these rival views. Most importantly, I share Cook’s belief that Turkey is no longer democratic. However, I argue that the presence of a large opposition and of nominally democratic institutions continue to place important constraints on Erdogan’s exercise of power. I argue that Turkey is best described as an example of competitive authoritarianism rather than patrimonialism. Political scientists Steven Levitsky and Lucan Way define competitive authoritarianism as a system in which “formal democratic institutions are widely viewed as the principal means of obtaining and exercising power,” but routine abuses of democratic institutions and practices by the incumbents “are both frequent enough and serious enough to create an uneven playing field between government and opposition.” Politics operates through nominally democratic institutions (i.e., free media, institutional checks on power, elections), but the rulers have used both formal and informal methods to corrupt and undermine these institutions to their advantage. However, and this is an important caveat, the rulers are not sufficiently powerful to eliminate these constraints on their power altogether. Thus, Turkey still has opposition print and television media outlets (though fewer than a decade ago), the judiciary and the Central Bank occasionally still act independently of Erdogan’s will, and opposition parties and civil society groups still vigorously (if not always effectively) contest elections and protest government actions. Recent developments illustrate the limitations to Erdogan’s personalization of power thus far. First, there is the electoral record. 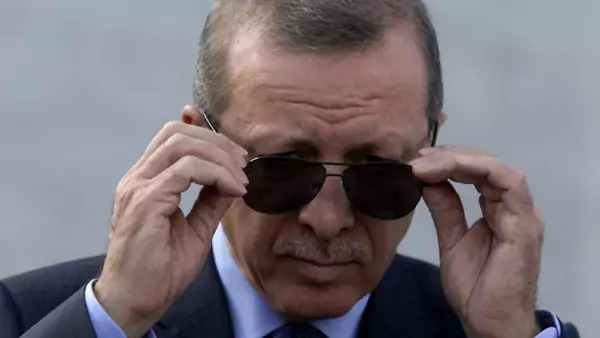 Given his Justice and Development Party’s (or AKP) extensive control of state resources and the media, it is surprising that only on one occasion has he or his party topped fifty percent of the national vote in an election. These election results matter. Despite the AKP’s landslide win in the 2011 general elections, it did not secure a large enough seat share in parliament (330 of the 550 seats) to propose a new constitution without support from the opposition. Since then, its popular support has plateaued in the range of forty-five to fifty percent. A related development is the increasingly regular mass protests to Erdogan’s rule. Starting with the Gezi Park protests of May/June 2013, a new wave of protests seems to occur every six to nine months. The most recent wave started recently in response to the brutal murder of a young woman in the city of Mersin, which sparked criticism about the government’s policy toward women’s rights. Though none of these protests has forced Erdogan into concessions (quite the opposite), efforts to suppress them are costly to his government and its image. Finally, Erdogan’s personalization of power remains a mixture of formal legal changes to eliminate institutional constraints and informal abuses of those constraints. His decision to chair a cabinet meeting in January was a good illustration as it was unclear whether this will become a pattern. While he has centralized the government’s control over the judiciary and the media, he still faces constraints. Occasionally, court decisions go against him. His efforts to pressure the Central Bank into deep interest rate cuts in February were only partially successful. And efforts to ban social media use by opposition supporters proved ineffective. In this respect, comparisons to Vladimir Putin’s Russia are appropriate, though Turkey is arguably not as personalized. This distinction between competitive authoritarianism and patrimonialism is important when one considers Turkey’s future trajectory. Competitive authoritarianism is an unstable arrangement, which largely reflects the inability of either the government or the opposition to fully impose its preferred rules of the game. Eventually, the government either succeeds at centralizing its power—creating a genuinely authoritarian state—or the opposition forces concessions or gains power itself. By contrast, patrimonialism would describe a consolidated authoritarian regime in which there is genuinely no opportunity for opponents to block Erdogan’s ambitions through formal institutional means. Consider the upcoming June 2015 parliamentary elections. There are two targets for the AKP. If the party gains 330 seats, it can propose a constitution for a referendum without opposition support. With 367 votes, it can pass a new constitution without the need for a referendum. If the AKP have anything less than 330 seats, then it would need (as it does now) support from some part of the opposition to propose a new constitution, which it has evidently not received thus far. Erdogan has spoken frequently of his desire to create a new “presidential” system that will formalize greater powers for himself and move Turkey further towards the sort of patrimonalism that Cook describes. What will happen if the AKP fails to obtain 330 seats, as in 2011? Erdogan can continue to centralize power through the legislative process (as with the judicial bill in 2014 and the presently debated security law) and he can also continue to centralize his power through informal means. Either approach is necessarily more limited and provides more blocking opportunities for the opposition. However, he will be unable to institutionalize the “presidential” system that he desires, leaving open avenues for opposition to block his actions. Given Turkey’s bizarre electoral laws, the most important question in this election will not be whether the AKP will win by a large margin (they will), but whether the third of Turkey’s opposition parties—the People’s Democratic Party (HDP)—can win ten percent of the national vote and thus obtain seats in parliament. If they do, it is highly unlikely that the AKP will gain 330 seats. If the HDP fall short of ten percent, then the AKP will easily secure 330. (As an aside, this would suggest that areas of strong HDP support would be the most tempting targets for localized electoral fraud). As a concluding thought, I would like to suggest a closer consideration of the means through which Erdogan has centralized his power and some ways in which they might be more constrained than we would think. There are various mechanisms at work, which may in turn suggest alternative possibilities for resisting further personalization. First, he has sought to undermine the formal independent powers of rival institutions, such as the military, the judiciary, and the intelligence services. This is the most durable and significant form of personalization. Second, he has infringed upon the powers of these institutions by informal means—such as by chairing a cabinet meeting or purging institutions such as the police or judiciary of unfriendly members. Third, single-party control for over a decade has allowed Erdogan and the AKP to “pack” institutions with loyalists. Thus, even nominally independent institutions may not check his power simply because their members share his ambitions. Fourth, a divided opposition has allowed Erdogan to parlay the support of only half of the population into largely unrivaled political control. This is the result of a combination of electoral math, which hurts smaller parties, and the ideological gulf between the three opposition parties, which often precludes closer cooperation. These final three means of personalization are more contingent, with each being subject to reversal as circumstances change. For example, the opposition could eventually coalesce effectively to defeat Erdogan or the AKP, or continued personalization could lead the AKP members within parliament or the judiciary to attempt to obstruct him. In summary, Cook’s article, “Emperor Erdogan,” is an important warning to Western readers about just how personalized the regime has become. I suggest that it is probably not that personalized…yet. What should be clear is that Turkey has fallen below any standard threshold of democracy. While there are good reasons to be optimistic about Turkey’s long-term (i.e., post-Erdogan) democratic future, its medium-term future is more likely to veer somewhere between the competitive authoritarianism that I describe and the patrimonialism that Cook describes. Weekend Reading: Erdogan and Davutoglu, Egypt’s Prisons, and Negotiating with Assad?